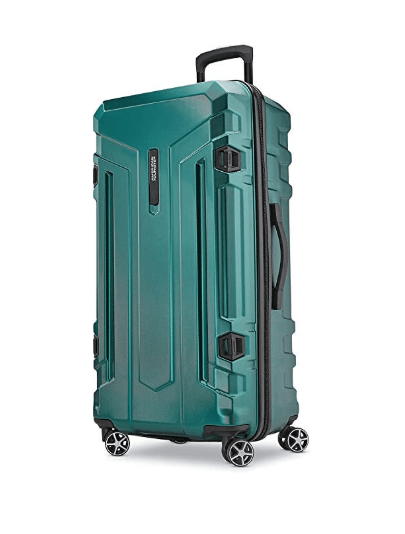 American Tourister Trip Locker (119607) is a rugged and contemporary looking 29-inch large checked suitcase with an ABS hardshell exterior, double spinner wheels and a functional and innovative design by Samsonite. It is rated 4.4 out of 5 stars by 12 customers on the day of this product review. You can purchase it in dark green (1259) or silver (1776) with a small price difference. It offers deeper and larger packing and storage capacity in the main section with the innovative 40/60 split design. This allows you to pack on the left and right sides, distribute the heavy items on one side and the lighter items on the other side evenly. It comes with 4 polypropylene lashing anchors on the outside for safe tie down. The zippers in the center opening seem quite solid and have the ergonomic zipper pullers. Wider multi-stop aluminum telescoping handle with a lightweight ergonomic design has the push-button grip that helps with more comfort- soft rubber seals and deluxe cushioning. And it lets you maneuver the bag easily even in tight spaces on its very solid, stable and large, 360-degree rotating double spinner wheels that roll smoothly and effortlessly. The exterior of the bag is resistant to impact and scratches with the debossed texture. 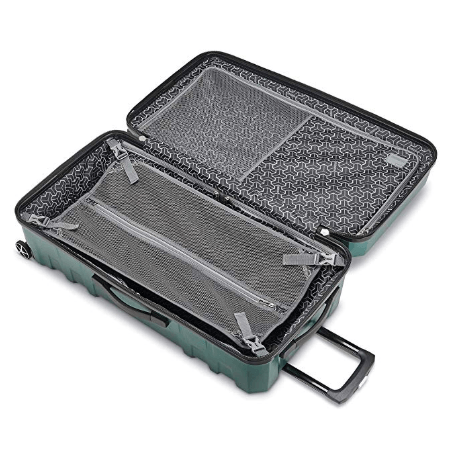 The 29” American Tourister Trip Locker Suitcase weighs 12.8 pounds and measures 31 x 21.25 x 13 inches including the handles and the wheels (29 x 21 x 13 inches without them). The retracting side and top handles also have an ergonomic design and are well protected. Both the dark green and silver colors are quite nice, they stand out in a crowd of suitcases without being too much. There is no reason you can’t use it on your business trips just like you can on family vacations. The sturdy ABS material on this bag does not make it totally hardshell but close to it and offers heaps more protection against impact and rain than a standard soft side luggage. It is quite flexible and you can easily compress it with a hand. Your clothes and any materials you carry for business will not be destroyed. With the 40/60 split design that makes it feel like a trunk it will be easier for you to pack and also find your items. But it is also easier to overpack this luggage and go over the airline weight limit. It is built quite sturdy and durable and should hold up well over time. You’ll get a Samsonite American Tourister limited warranty of ten years as a back-up of great Samsonite quality and a company that stands behind its products. You can expect a high quality, good-looking, functional, versatile luggage that is fun to use from American Tourister brand that has more than 75 years of history in the travel products business and a great range of products for business travel and casual holidays. And with the American Tourister Trip Locker suitcase you’re getting more than what you pay for. We certainly recommend it if you have the budget for it, as it is not the cheapest bag on the market.